A unique reading of the commissioned text, Wollstonecraft Live! 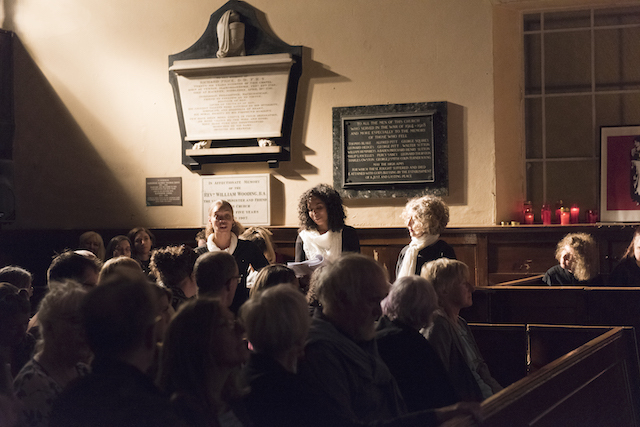 which depicts the shooting of a biopic of Mary Wollstonecraft’s life, with actors and an original music score took place in the atmospheric 18th century Unitarian Chapel in Newington Green. Director Professor Anna Birch told us about Mary Wollstonecraft and the “Mary on the Green” campaign for a statue of her on Newington Green. 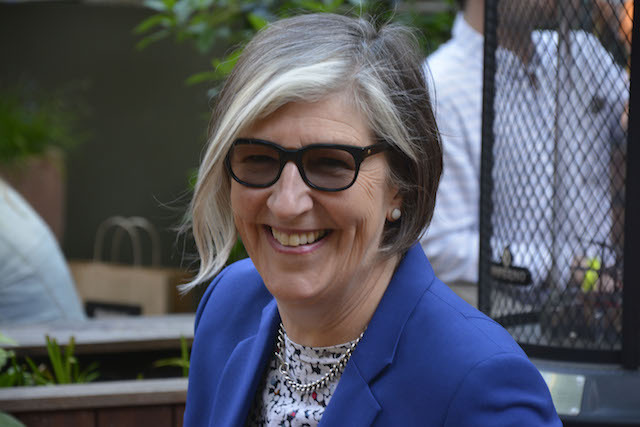 Professor Anna Birch FRSA is a theatre director, researcher and activist. She works to celebrate both the life and legacy of women hidden from history and, in particular, Mary Wollstonecraft. 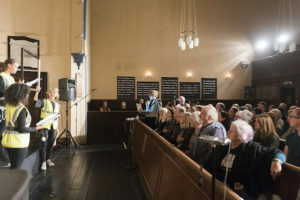 Birch has curated exhibitions, published books, screened lms inside and outside, commissioned writers and artists, and collaborated with community centres and museums. 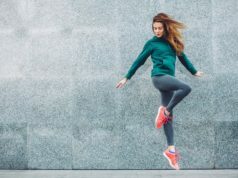 These include Walking Women, Glasgow Women’s Library, Mildmay Community Centre, Newington Green Action Group, New York Air Gallery, and Queen Mary University. When did you learn about Mary Wollstonecraft? I have lived in Stoke Newington for over 30 years. In the late 1990’s I learnt that Mary Wollstonecraft lived and worked on Newington Green in the 18th century. My children attended Newington Green Primary School and in 1999, or thereabouts, the school librarian gave me a local history book by local historian Pat Haynes. In the book, there was a section on Mary Wollstonecraft and her life on Newington Green and I got very excited to have this radical feminist, eighteenth century neighbour. I had a copy of the biography by Clare Tomalin and a copy of A Vindication of the Rights of Woman on my bookshelf and I started to read them. Her writing is so inspired and contemporary that as a theatre director I included her in a Stoke Newington Festival event to mark the millennium, and then commissioned Kaethe Fine to write Wollstonecraft Live! to be performed both on Newington Green and in the Unitarian Meeting House. This event celebrated the regeneration of Newington Green, led by the Newington Green Action Group in 2005. The new generation talk about feminism, but do they know about Mary? Our work is accessible, well informed, often funny and relevant to the concerns of all women- all women matter to us. You will notice that the casting for Wollstonecraft Live! is inter-generational, mixed race, local and from further a eld. 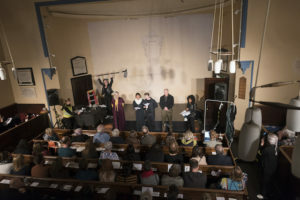 The audience are extras in the filming of this biopic of Mary Wollstonecraft and they participate and interact with our cast, the historical location of the Unitarian Meeting House, and the inspirational writing of Mary Wollstonecraft. Her writing is intense and can be dense but, in our approach, we create a ‘living monument’ where the audience interact with her-story and take their own version of Mary Wollstonecraft away with them. 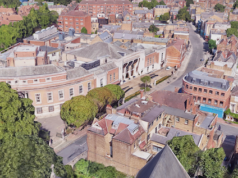 There is plenty of food for thought in our productions and people remember Wollstonecraft when they cross Newington Green to catch a bus, or see the plaque on Newington Green Primary School to honour her. People tell us that we wet their appetite for Wollstonecraft and that they go away and nd out lots more about her from the numerous biographies and web pages now written about her. 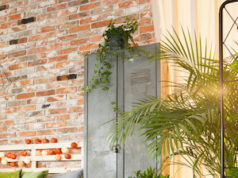 Whats’s the latest news about the Mary on the Green Campaign? Our very special event takes place in the atmospheric Unitarian Meeting House where Mary Wollstonecraft (1759-1797) meditated and prayed in Pew 19. Wollstonecraft Live! invites you to enjoy Wollstonecraft’s writing and her letters as you take part in the filming of a biopic of her life. The event commissioned, fundraised and managed by the Wollstonecraft Presents. In the pioneering spirit of Wollstonecraft herself, imagine how she would tell her life story set on Newington Green, where she ran a school for girls. Here she tested her ideas for girls’ education, which in her view was linked to citizenship, emancipation and independence. 2018 marks the 100th anniversary of selected women and men being granted the right to vote, reminding us that our eighteenth century neighbour and human rights activist was also a trailblazer to Parliament. Newington Green offered Wollstonecraft the support she needed to become a successful writer, and to fund both her life as an independent woman and to support her extended and dependent family. 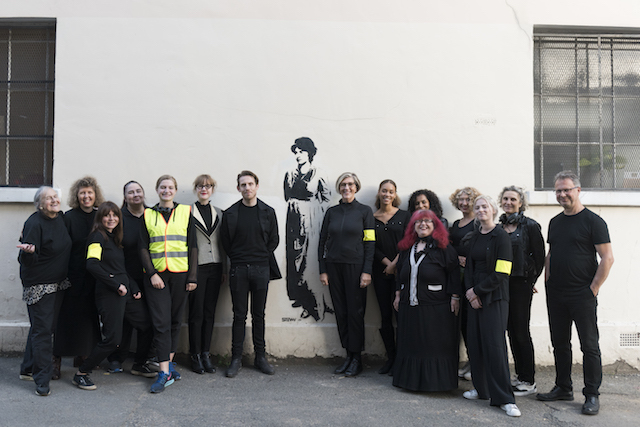 Fragments & Monuments performance and lm company continues to be fascinated by the contribution made by Wollstonecraft in her extraordinary, short life. As a consequence of working on ‘location’ a work style found on lm/TV locations is a hallmark of Fragments & Monuments’ production design. The lm crew follows the performers and audience as lm crew and paparazzi might, to create an atmosphere of celebrity and ‘event’. Filmed performances are taken back to the original location and projected onto buildings and large screens, and broadcast using the internet.